On September 20, 2018, UNESCO Almaty Cluster Office, in cooperation with the National Commission of the Kyrgyz Republic for UNESCO, organized the first meeting of the Working Group on Developing Online Curriculum to Mainstream Cross-Cutting Competences for Sustainable Development. The first meeting of the Working Group was organized in the frames of project on mainstreaming ESD and the 21st century competencies, with financial support from Estonia. The project will contribute to promoting quality education through the use of Information and Communication Technologies (ICT). In particular, it will provide digital content on Education for Sustainable Development (ESD) for secondary education in order to improve access to information and promote interactive learning and strengthening teacher competencies in ESD and ICT in education. Ten members of the Working Group, international experts from India and Estonia, UNESCO Almaty, and the UNESCO National Commission participated in the meeting. The event outlined the way forward for a project to develop online curriculum to mainstream interdisciplinary competences for sustainable development. As background for discussion, Aditi Pathak from the UNESCO Mahatma Gandhi Institute of Education for Peace and Sustainable Development (MGIEP) presented an online interactive learning platform developed for digital intercultural exchange. In another key presentation, Veronika Svists from an Estonian NGO “Mondo” spoke about the NGO’s offline and online materials on globalizing world and protection of human rights to support teachers in planning the learning process in different countries, including Estonia and Ukraine. 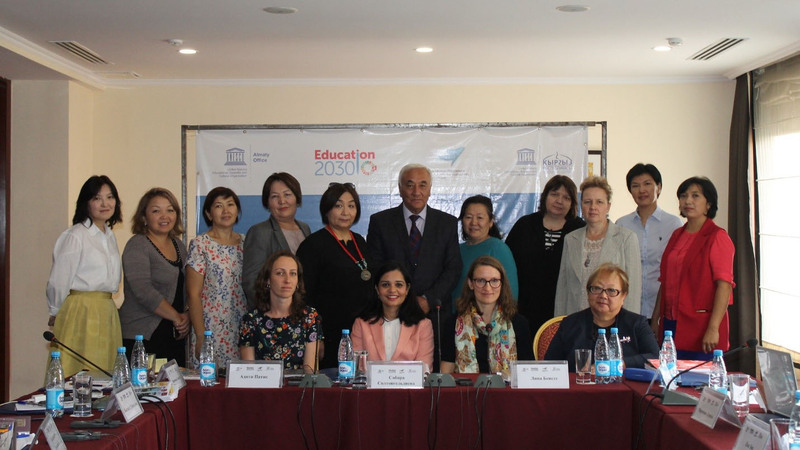 Following the presentations, Working Group members identified specific education for sustainable development topics in line with the State educational standard of general school education in Kyrgyzstan. They also discussed the process for adapting existing content and developing new teaching and learning materials and developing an online interactive learning platform. As a result, the group came up with a preliminary project work plan, including the target audience, objectives of a course, subjects of modules, timeline, and potential distribution of responsibilities. UNESCO Almaty serves as the Secretariat of the Working Group.